Stereo Parts / spares for reference and occasionally for sale. 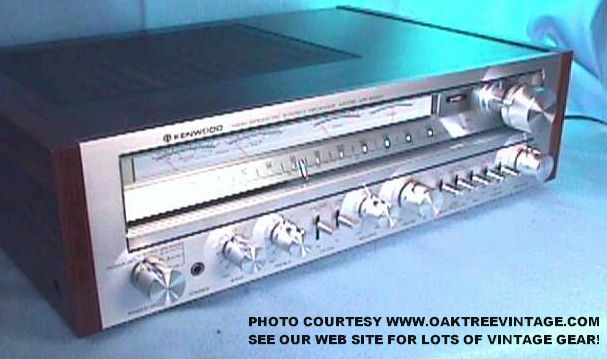 Kenwood Parts for receivers, amplifiers, models KR-710, KR-820, 3200, 3600, KR3600, KR-3090, KR-5030, KR-4140, KR5030, KR-6050. 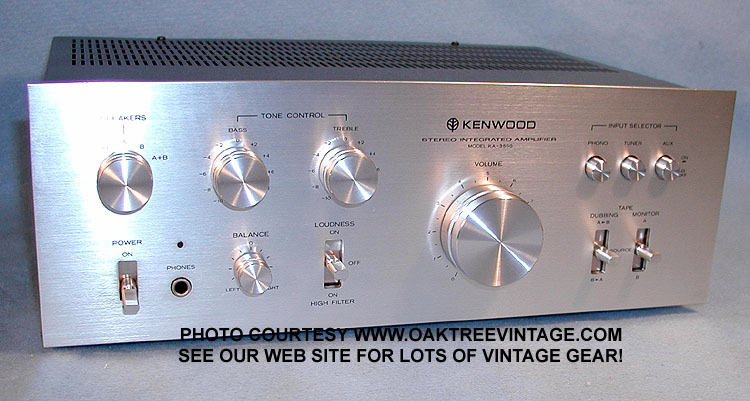 Kenwood Stereo Receivers electronic repair parts. 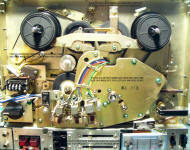 20% off sale on salvage stereo parts. 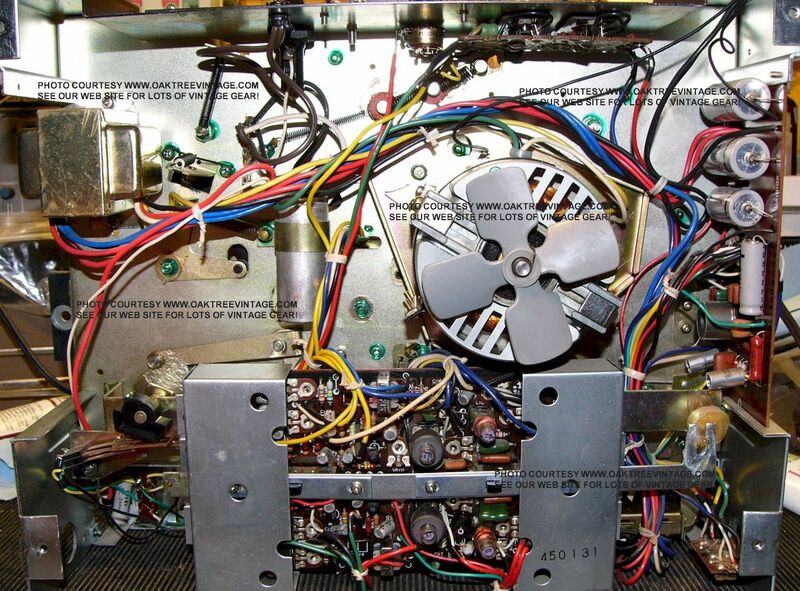 Most of these components are "take-outs" from stereo gear that for various reasons we 'chopped' and unless otherwise noted are in serviceable / working condition / shape! In the case of output transistors, they will be tested / checked prior to posting and once again prior to shipment, pots / switches will be 'cursory' cleaned, parts already missing / utilized from circuit board will be noted, transformers will be checked prior to posting. Filter capacitors will be tested / checked prior to posting and once again prior to shipment and 're-conditioned' / 're-formed' if necessary. ... OR, CLICK HERE TO SEE OUR SERVICED & WARRANTED RECEIVERS CURRENTLY FOR SALE! Face panel, Face plate / Front panel (less knobs / buttons) buttons. SOLD??? Knobs / Caps / Buttons / Covers, �Volume�, round, 'large' knob. Large scratch across face. Better than nothing, but not pretty - $20. Knobs / Caps / Buttons / Covers, �Speaker�, �Bass�, �Treble�, round knobs - $25. ea. Knobs / Caps / Buttons / Covers, �Balance�, round knob - $25. Caps / Buttons, �Push� button 'CAPS' for 'Input Selector Switches' 'Tuner�, 'PHONO', or 'AUX' - $20. ea. Switches / Selectors, �Loudness� Toggle switch, ALPS 4005-0 (not interchangeable with other toggles on this model (caps sold separately - $35. Switches / Selectors, �Dubbing� Toggle switch, ALPS 4002-0 (not interchangeable with other toggles on this model (caps sold separately - $35. Switches / Selectors, �Monitor� Toggle switch, ALPS 2002-0 (not interchangeable with other toggles on this model (caps sold separately - $35. Switches / Selectors, 'Speaker Switch' Rotating 'Wafer' switch (less knob which is sold separately) - $45. Switch, Power Toggle Switch Matsushita TV-3 / 5DU3P 3A/250VAC, 9630W / 1002-05 (toggle cap sold separately) - $40. Control Potentiometer / Control, Volume Control Pot - $45. Control Potentiometer / Control, �Bass�, Treble�, control pots, R06-4028-05 / 50kOhms x2 - $30. ea. Control Potentiometer / Control, Balance R06-5019-05 / 100kOhms x2 - $30. 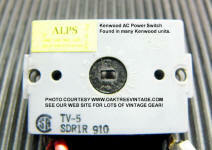 Transformer, Power supply Transformer L01-1191-15 / SM-61014 (North American Version) - $55. Heat sink, Aluminum Heat sink - $35. Heat sink, Full Wave Bridge Rectifier S5VB Original old stock Japanese. NOT Chinese knockoffs / counter-fits - $20. Circuit Board, �Control PCB� circuit board #X08-1530-00 / J25-1421-13 includes w/ Transistors 2SA640, 2SA872, and balance of resistors, capacitors, variable resistors and diodes (not including controls / pots / switches) -$45. Circuit Board, �Input Selector' PCB� circuit board includes w/ Transistors 2SA640, 2SA872, and balance of resistors, capacitors, variable resistors and diodes (not including 'self cancelling' push switches) -$35. Circuit Board, �Main amp� circuit board assembly containing power supply circuits, #X07-1470-10 / J25-1415-13 with transistors: JRC 'metal' 2SA620, Mitsubishi 2SA721, 2SA673, 2SA733, 2SA850, 2SC945, 2SC1222, 2SC1735, 2SC1885, (less output transistors, heat sink, bridge rectifier, & filter capacitors) but with balance resistors, capacitors, transistors, diodes, voltage regulators, connectors, and PC mounted pots / variable resistors - $85. Jacks / Terminals / Connectors, INPUT RCA I/O jacks / connectors. Sold in set of 3 for 'Phono', 'Tuner', 'AUX'. - $30. Jacks / Terminals / Connectors, Tape Monitors RCA I/O jacks / connectors. Sold in pairs. - $30. ea. Jacks / Terminals / Connectors, Tape Monitors 5-PIN DIN I/O jacks / connectors. - $20. ea. Jacks / Terminals / Connectors, �Head Phones� Jack 1/4" - $25. Jacks / Terminals / Connectors, AC �convenience� outlets - $20. ea. Panel, �Rear� (sheet metal only, less connectors, Jacks / Terminals / Connectors, terminals & components) - $30. Metal top panel cover - $30. Face panel with glass (less knobs / buttons.) - $30. Bass, Treble or Balance knob - $18. ea. Tuning Dial pointer (lighted) - $20. Power supply Transformer L01-2091-08 - $40. Power supply filter Caps 44v / 6800 uf- $15. ea. Any single circuit board (less pots, switches, large transformers, outputs) - $40. Tuning Flywheel (weighted metal) - $20. Tuning circuit board w/ tuning cap (less switches) - $40. Tuning string flywheel (plastic) - $20. Any control pot; volume, bass, treble, tone, balance (unless listed separately) - $25. ea. Any switch (unless listed separately) - $25. ea. Any single rear panel Input / Output component - $30. ea. Set 4 feet - $20. AM antenna w/ bracket - $25. 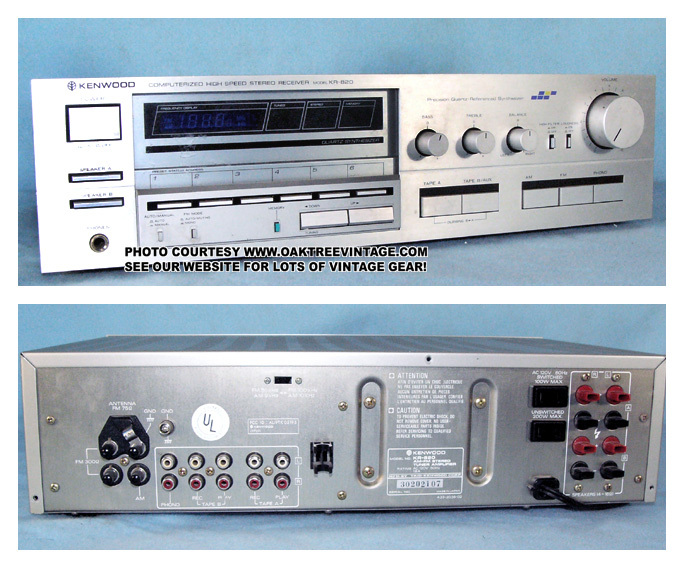 Kenwood KR-820.Stereo Receiver for repair. Looks great and has all it's parts, but blows main fuse upon power up. Problem unknown. 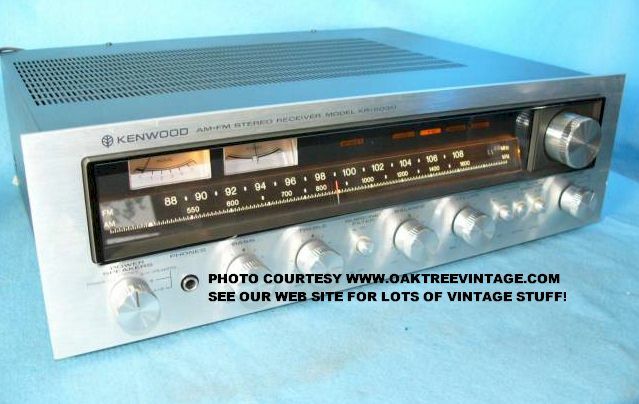 KENWOOD KR-3090 / KR3090 PARTS / SPARES. Face panel with glass (less knobs / buttons.) (has some wear and a name engraved in the top edge) - $40. Volume knob, Tape Monitor or Speakers knob - $25. ea. Knobs / Caps / Buttons / Covers, Push Switch caps (for Hi Filter, Loudness, Power or Mono / Stereo Mode) Fits / See also Kenwood KR-3090, KR-4070, & KR-5030. Come with plastic retainers that glue to face plate - $20. ea. 1 remaining in stock on the KR-3090. VU / Tuning meters - $25.ea. Jacks / Plugs / Connectors, Headphone jack - $20. Jacks / Plugs / Connectors, Rear Speaker output binding posts in pairs (see also Kenwood KR-3090, KR-4070, KR-5030, KR-6030) - $35. for section of 8 posts. Antenna, AM 'Stick' antenna w/ bracket / swivel mount (See also Kenwood KR-3090, KR-4070, KR-5030, KR-6030 & KR-8010) - $30. 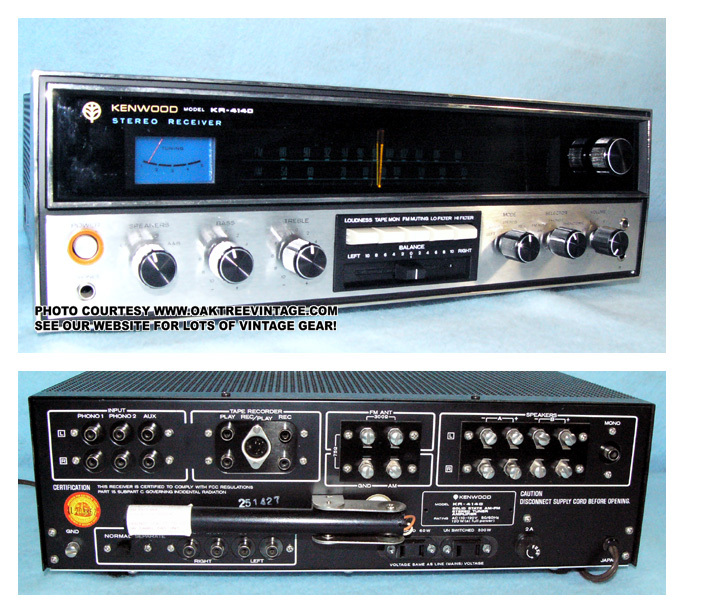 Kenwood KR-3200 Stereo Receiver for repair. Looks great and has all it's parts with the exception of one antenna screw, but power low on one side. Likely needs outputs. - Unit powers up, with good output. Has bad "Input Selector" switch so it's the chopping block for this fellow. Cosmetics decent overall. Pots and switches will be cleaned prior to shipping. 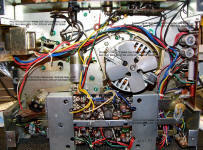 Many of the parts such as controls, pots, switches and knobs MAY* also fit KR-3600, KR-4600, KR-5600 & KR-6600 models. Panel, Sheet metal, top panel cover - $30. Panel, Tuning Scale �light box�, (rubber lamp / bulb sockets and bulbs not included) - $20. Meter, VU �FM tuning� meter - $25. Pointer / Indicator, Tuning �Dial Pointer� - $25. Flywheel, �Tuning� flywheel & bushing - $30. Knobs / Caps / Buttons / Covers, �Volume� knob (pot sold separately) - $25. Knobs / Caps / Buttons / Covers, �Power� push switch cap - $20. Knobs / Caps / Buttons / Covers. �Balance�, �Bass�, �Treble� knobs � $18. ea. Knobs / Caps / Buttons / Covers, �Hi filter�, �Loudness� push switch caps - $12. ea. Potentiometer / Control, �Volume� control pot ALPS #68N-0650180- 100kOhms Bx2(less cap sold separately) - $30. Potentiometer / Control, �Balance� control pot, ALPS #72a 0150160 200k Ohms W (less knob sold separately) - $30. Potentiometer / Control, �Treble�, �Bass�, control pots - R06-2007- 05, R M5kOhms x2 (less knob sold separately) - $30. ea. Switches / Selectors, �Power� Push switch, ALPS SDG5P J / TV-3, with clamping capacitor (less cap /button sold separately) - $30. 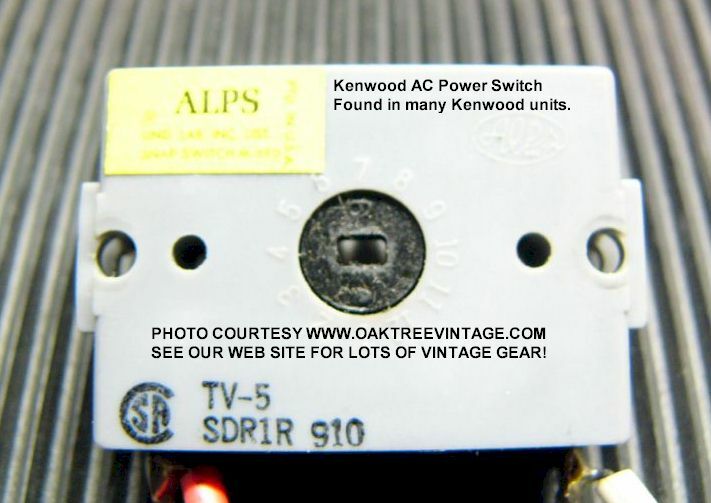 Switches / Selectors, Rotary / Wafer �Speaker� switch ALPS #1083 72 R - $40. Switches / Selectors, �Mode� / �MONO/STEREO�, latch push switch (cap sold separately) - $25. 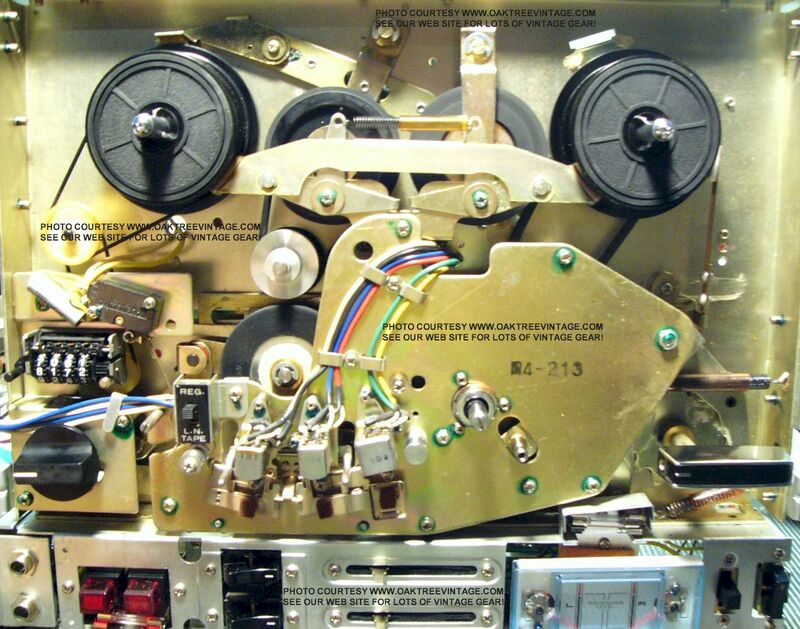 Switches / Selectors, �Tape Monitor� wafer switch - $25. Tuning Capacitor, 5.Gang tuning capacitor ALPS partial number, (obscured) #-0185-05 (less circuit board) - $25. String Wheel, Plastic String �Tuning� Wheel - $25. Circuit Board, �Tuning� circuit board # J25-1051-72 X05-1170-00 with transistors: 2SA640, 2SC381, Hitachi 2SC1342, 2SK55, Mitsubishi 2SC828A, and L35 0058-05, IC Mitsubishi AN217, NEC uPC554C and balance of board mounted capacitors, resistors (less ALPS tuning capacitor sold separately) - $45. Circuit Board, �Selector� circuit board #YKC43HB / J25-1412-14 / X08-1520-10 with horizontal package TA7136P, and balance of capacitors, resistors (less selector switch) - $45. Circuit Board, �Output / amplification� / �Main�, circuit board # J25-1471-03 / X09-1140-11 / 12 with transistors; 2SA529, 2SA620, 2SA733, 2SA842, 2SC945, 2SC1439, Hitachi 2SA673, Mitsubishi 2SA777, Mitsubishi 2SC1509, MPC70.0 47Ohms K and balance of capacitors, resistors (less potentiometers, heat sink, output transistors, speaker selector / switch sold separately) - $55. Circuit Board, �Power Supply� circuit board #J25-1410-14 / X00-1740-10 (less power supply capacitors sold separately)) with balance of rectifier diodes, small electrolytic cap, ceramic-disc capacitors and resistors - $30. Transformer, Power supply Transformer #L01-1131-05 / SM-70304 - $45. Capacitors, �Power supply filter cap�, Nippon Chemi-con 4700000uF 40 Volts - $20. ea. Jack / Connector, �Headphone� jack, � inch - $25. Jack / Connector, �Antenna� Connectors / post / terminals as set of 4 - $25. Jack / Connector, �DIN�, Tape Rec / Play, jack / socket - $20. Jack / Connector, AC Convenience outlet / Socket, �AC Convenience� sockets (Fits Kenwood KR-3600, KA-5500 and likely others) - $15. ea. Antenna, AM �Stick� / Ferrite bar / rod antenna w/ hinge bracket - $30. Panel, �Rear� sheet metal panel (less all jacks /connectors, bracket) - $30. Foot / Feet, set of 4 - $20. Unit powers up, with good output and was working well, we finished general refurbish, then the FM tuner quit. Everything else still functions fine. The driver boards / outputs are fine and produce 25.5.Volts @ 8 ohms for 81 Watts per channel and 22 Volts @ 4 ohms for 121 Watts. Unit VERY good cosmetically. Face, case, rear panel and face wood end caps in great condition. Knobs all look new. Pots and switches will be cleaned prior to shipping. Many of the parts such as controls, pots, switches and knobs MAY* also fit other KR models. Main Face panel with glass (less knobs / buttons.) - $40. Face Panel, lower insert with tone controls holes etc. - $35. Large round knobs (same as Kenwood KR-4140 & KR-7070A and may be the same as others. Slightly different than the KR-7070 'NON-A' version) - $20. ea. Push Switch caps - $12. ea. Tuning Capacitor 7 gang (less plastic string wheel) - $40. Plastic Tuning String Wheel - $30. Power supply filter Caps 2200 �F / 35.v - $15. ea. Power amplifier sides NEC 2SD155 Transistors - $35. ea side. Any single circuit board (less pots, switches, large transformers, outputs) - $45. Any rotary control pot - $25. ea. Linear Balance Control pot / fader - $35. Any push switch (other than power) - $25. ea. Speaker, Input or mode Selector switch - $30. ea. Voltage selector fuse cap insert - $20. Any single rear panel Input / Output component - $25. ea. Antenna, AM 'Stick' antenna - $30. Unit powers up, with good output and was working well, we finished general refurbish, then the FM tuner quit. Everything else still functions fine. The driver boards / outputs are fine and produce 25.5 Volts @ 8 ohms for 81 Watts per channel and 22 Volts @ 4 ohms for 121 Watts. Unit VERY good cosmetically. Face, case, rear panel and face wood end caps in great condition. Knobs all look new. Pots and switches will be cleaned prior to shipping. 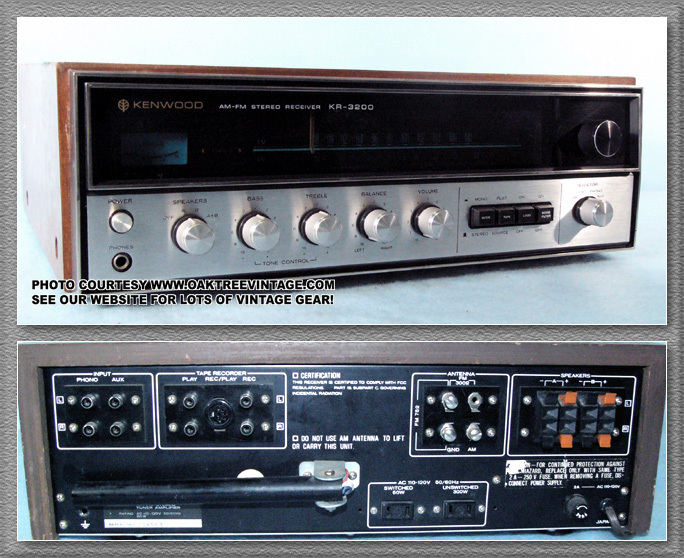 Many of the parts such as controls, pots, switches and knobs MAY* also fit Kenwood KR-3090, KR-4070, KR-5030 & KR-6030 models. Knob / Button / Cap, Tuning knob 1 5/8" Diameter (See also Kenwood KR-4070, KR-5030, KR-6030 & KR-9600) - $35. Knob / Button / Cap, Medium-Large, round knobs ie; Volume, Balance, Bass, Treble, Power / Speaker, Input Selector (See also Kenwood KR-4070, KR-5030, KR-6030 & KR-9600) - $25. ea. Transformer, Power supply Transformer L01-1441-05 / 102B009 / JK07N) - $55. Capacitors, Power supply filter Caps (Elna 50v / 10000 uf) - $20. ea. Transistors, Power amplifier sides (w/ Sanken 2SA981 / 2SC2261 Output transistors)- $55. ea. side. Circuit Board / Card, Any single circuit board (less pots, switches, large transformers, outputs, large filter capacitors) - $45. Circuit Board / Card, Rectifier / Power Supply circuit board w/ bridge rectifier MAC-3 / 3590 and voltage regulator 2SC789 and balance of resistors, diodes and most capacitors (less large, Elna 50v / 10000 uf filter capacitors) - $45. Potentiometer / Pot / Control / Fader, Any control pot such as Volume, Balance, Bass, Treble - $25. ea. Occasionally this switch will be designed with 'duplicate' terminals on the other side which allows the switch to be inverted for a 'fresh' set of contacts. Fuse Holder, Voltage selector with fuse insert cap - $35. Fuse Holder, Voltage selector fuse cap insert - $30. Unit powers up, with good output. Power switch was arcing and causing a "fizzing" / bacon frying sound and at the time, we didn't have a replacement and the original power switch was beyond repairing. Everything else still functions fine. The driver boards / outputs are fine and produce 25.5 Volts @ 8 ohms for 81 Watts per channel and 22 Volts @ 4 ohms for 121 Watts. Unit VERY good cosmetically. Face, rear panel and face wood end caps in great condition. Knobs all look new. Pots and switches will be cleaned prior to shipping. Panel, Face panel with glass (less knobs / buttons.) (small dings to left end between left edge and dial window) - $49. Circuit Board / Card, Rectifier / Power Supply circuit board w/ bridge rectifier MAC-3 / 3590 and voltage regulator 2SD613 and balance of resistors, diodes and most capacitors (less large, Elna 50v / 10000 uf filter capacitors) - $45. Switch, Any push switch - $25. ea. With the exception of an issue with the unit's protection relay tripping when the "Subsonic Filter" is switched to "On", everything works great. The driver boards / outputs are fine and produce 22 Volts @ 4 ohms for 121 Watts per channel. Many of the parts such as controls, pots, switches and knobs MAY* also fit KR-7050, KR-8050 & KR-9050 models. Panels / Plate, Face panel with glass (less knobs / buttons.) - $55. Knobs-Buttons-Caps, Tuning knob - $30. Knobs-Buttons-Caps, Power / Speakers, Volume, Input Selector knobs - $25. ea. Knobs-Buttons-Caps, Bass, Treble, Balance knobs - $20. ea. Knobs-Buttons-Caps, Toggle Switch caps - $12. ea. Potentiometer / Control, Volume Control Pot (NOBEL) - $35. Potentiometer / Control, 'Balance' control pot / potentiometer ALPS 922h-0650300-200kΩM N (We do know that the balance pot from the KR-6050 will NOT fit the KR-8050, as it is about half the physical size) - $35. Potentiometer / Control, 'Tone' / 'Bass' / Treble' Control Pot ALPS 922h-0620100-5kΩx2 - $25. ea. Switches / Selectors, 'Power / Speaker' Selector 'wafer' switch (on circuit board X09-1350-10 ELNA) (not including 'power switch component ALPS SDR1R TV-5.grey box') - $35. Transformer, Power supply Transformer LOI-1731-05 (ETP96HU4A) - $65. Capacitors, Power supply filter Caps ( ELNA 50V-10000uF / 50v-1000μF) - $20. ea. Circuit Boards / Cards, Any single circuit board not already listed separately (less pots, switches, large transformers, Filter Caps, Rectifiers, outputs, etc) - $45. Circuit Boards / Cards, 'Tone-Control' Circuit board Elna X09-1350-10./ J25-1658-02 w/ semiconductors including 22D762 voltage regulator (less large control pots & switches) - $45. Circuit Boards / Cards, Power Supply Circuit Board Elna X09-1350-10 / J25-1658-02 (less Filter Caps, & Relay, but with balance of components including M4C41 Full Wave Bridge Rectifier, thyristor, coils, resistors etc.) - $45. Circuit Boards / Cards, 'Main Tuner / Selector / I/O Jack' Circuit board X05-1650-10 / J25-1648-02 (ELNA BUILT) w/ IC chips HA11225 (FM IF Amplifier and Demodulator with Muting, Center Meter and Signal Meter IC chip), Hitachi HA1197 (AM tuner chip), HA11223W (PLL FM stereo demodulator w/pilot cancel), MC14069ub (hex inverter chip), 6-Gang Tuning capacitor, coils and transformers and all other components such as resistors, diodes and capacitors (less switches, controls, I/O jacks) - $55. Rectifier / Diodes, Power Supply Rectifier M4C41 / 3918 - $25. Relay, DEC Type MS4U 24VDC Relay (not the same as in the KR-5030) - $30. Pointer, Dial pointer - $20. Flywheel, Tuning flywheel assembly - $25. Wheel, Tuning String wheel (plastic) - $25. Fuse / Selector, Voltage selector with fuse insert cap - $35. Fuse / Selector, Voltage selector fuse cap insert - $30. Jacks, Speaker output jack / binding post section A&B on ELNA J25-1658-02 - $35. Jacks, Antenna binding post section - $20. Antenna, 'Bracket' for AM antenna 'stick' - $25. Antenna, AM antenna ('stick' only) - $20. Panel / Plate, Rear panel (less components, sheet metal only) - $20. Unit powers up, with good output. Right channel power meter always registers at least 1 watt when unit is powered up and the right side is a bit under biased on the scope. We swapped the left and right driver / output boards and the problem stayed on that side so it's something upstream of the driver boards. The driver boards / outputs are fine and produce 20 Volts @ 4 ohms for 100 Watts per channel. The power switch is also going out. Unit VERY good cosmetically. Face, case, rear panel and face wood end caps in great condition. Knobs all look new. Pots and switches will be cleaned prior to shipping. Amplifier, Power amplifier outputs (Works. Was substituted in another 6050 to determine it's condition. Output transistors independently tested. Board is complete and output transistors are Hitachi 2SD924A & 2SB784A ) with ELNA X07-1700-10 / J25-1657-04 driver boards intact and including 2SA794 & 2SC1567 driver transistors and 0.22 Ohm emitter resistors - $45. ea Left or Right side. Antenna, AM antenna - $30. Below are internal reference shots only. We do not have any parts, service, nor advice relating to any of the below machines. These photos are ONLY for your reference. 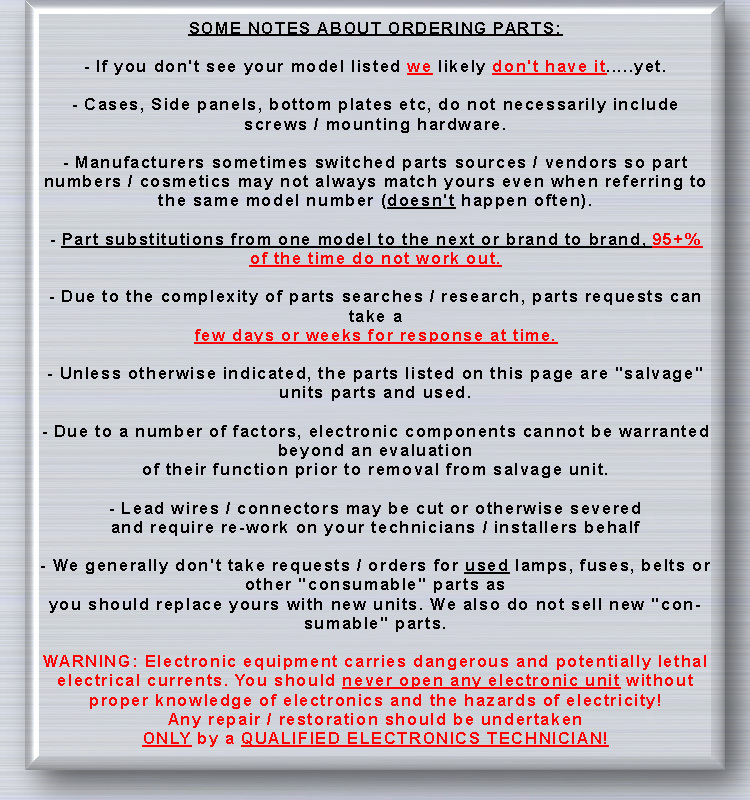 Please do not contact us for parts or service advice for any of the units shown in the below photos.